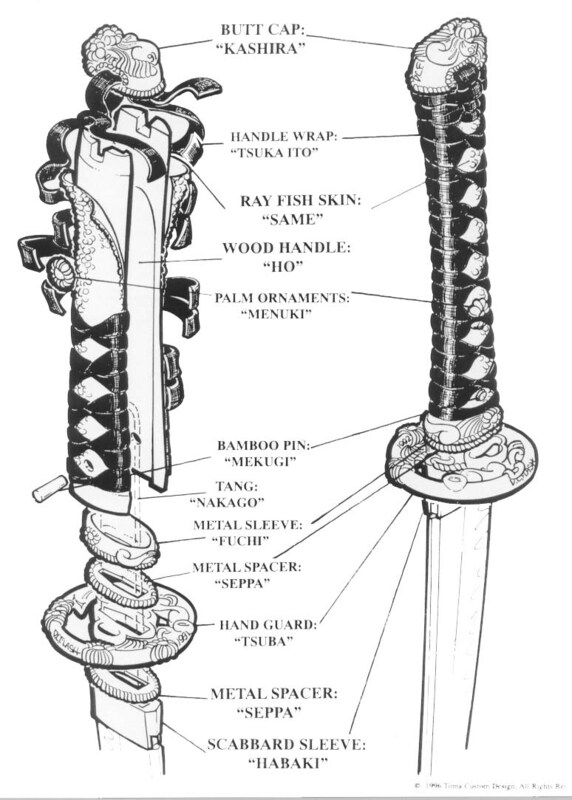 Our Handle (Tsuka) wrapping service has been satisfying customers for over 23 years. Our continued success is a result of our skilled craftsmen who have been 'Japanese' trained in the subtle nuances that make a wrapped handle look Great instead of merely acceptable. Our handle wrapping and sword restoration service is available to owners of WW-2 Military Swords, Samurai-era Japanese�Swords, Chinese-made copies of Japanese Swords and domestically-forged Japanese-style replica Swords... just about anything but the $25 gift shop display swords. Learn More about our Silk, Leather and exclusive Martial Arts Tsunami handle wrapping cord (Tsuka-ito). Learn More about Stingray Skin - aka: Samé, Samégawa. We recommend that customers scrutinize the wood core/foundation of their Handles for shrinkage, cracks and other damage, especially in the area of the Mekugi-ana (peg hole).�Most Japanese Swords are at least 70+ years old and in many cases have not been well cared for. Wood deteriorates and if damage is obvious, safety becomes an issue a complete replacement of the Handle is often recommended. Note: Please do not send swords or handles without first calling or e-mailing us to confirm turnaround time and to receive any special shipping instructions. As a special favor to all of us here at the Fred Lohman Company, please no Packing Peanuts! If you are unable to remove the handle from the sword, it is best to send the entire sword but return postage/insurance charges will be added.�Do not send your Sword Bag. We try to maintain a turn-around time of 3-4 weeks for Handle Repairs.